Fremont, California — April 17, 2012— Intematix Corporation, a leading innovator of patented phosphors and phosphor components for high-quality LED lighting, with Production Resource Group, L.L.C., (PRG), the world’s leading entertainment lighting company, today announced the offering of a long sought after film and television lighting solution. Intematix’s ChromaLit™ remote phosphor creates precision spectral quality in PRG’s new TruColor™ HS, a digital soft source light fixture. TruColor HS utilizes ChromaLit to deliver a nearly continuous wavelength spectrum that eliminates the color-accuracy limitations inherent in many LED fixtures. PRG’s latest offering features Intematix ChromaLit Panels customized to meet the high standards for motion picture and broadcast lighting. 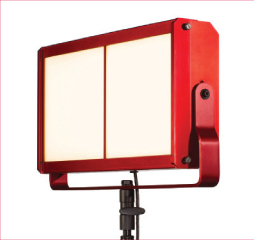 The interchangeable panels deliver 96 CRI at 3200K and 90 CRI at 5200K, allowing users to achieve both daylight and tungsten with a single fixture. ChromaLit makes lighting better using a phosphor composite substrate separated from the blue LEDs. This architecture increases system efficacy by up to 30 percent compared with conventional white LEDs, which enables a single TruColor HS to produce a remarkable 20,000 lumens. PRG’s TruColor HS will be on display at the National Association of Broadcasters (NAB) Show in Las Vegas from April 16th – 19th. For additional information and pricing, please visit PRGTruColor.com. To learn more about ChromaLit, visit Intematix.com. ChromaLit will be on display at Light + Building in Frankfurt, Germany from April 15th - 20th and LIGHTFAIR in Las Vegas from May 9th – 11th. Production Resource Group, L.L.C., (PRG) is the world’s leading supplier of entertainment and event technology to a wide range of markets, including corporate and automotive events, concerts, special events, theatre, television and film, trade shows, and installations, such as theme parks, museums, retail stores and performing arts centers. PRG provides integrated services and equipment, including audio, video, lighting, rigging, staging, and scenery and automation systems, for these markets from more than 40 offices in North America, South America, Europe, Africa, Asia and Australia. For more information about PRG, please visit www.prg.com.